Guru Ashtakam was written by Shri Adi Shankaracharya and tells about the necessity of the Guru and attaching our mind to the Lotus Feet of the Guru. Also, given are extracts from a lecture of Swami Vivekananda on the need of a spiritual Guru. Body is handsome, wife is attractive, fame spread far and wide, wealth enormous and stable like Mount Meru; but of what consequence are all these, if the mind is not riveted in devotion to the lotus feet of Guru? Really of what use is all this, what use, what use? Wife, wealth, son, grandson, and the like, house, relations, even if all these are there fate is certain, of what consequence is one's life if his mind is not devoted to the feet of Guru? Ascertain, what use is any possession, person or object? Of what use, of what use, of what use indeed? All the Vedas are mastered and ever present on the lips; likewise, knowledge of all the sciences is well gained. The ability to write prose or verse is also present. 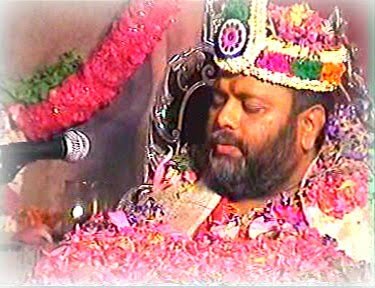 Even then, of what ultimate benefit is all this, if one's mind does not devoutly rest on the feet of Guru? By whose grace along can one's soul be liberated? Of what use, of what use, of what use indeed? Your feet may be worshipped constantly even by the great kings and emperors of the world for reason of your greatness and scholarship; but of what real consequence is that if the mind is not graced by the blessing of unflinching devotion to the Guru, by whose loving 'touch' alone can redemption and peace be realized? Of what avail if one has enough merits to think my fame has already spread in several places due to my unique generosity and a result, all things of the world stand within my easy reach? For, the virtue and quality that count ultimately is only one's unflinching loyalty and devotion towards the Guru whose blessings are the ultimate factor for realization of Truth by a devoted seeker. The mind may have lost its charm to live in forests, and likewise in the house; may have lost all desire to achieve whatever; even the concern for the body's welfare may have been outlived; the most invaluable treasure of the world may not hold any allurement. Even then, of what avail are all these if the supreme devotion to the Guru is not held by the aspirant? Determine, of what use? of what use? Namah Shivaya.. Thank you for posting this video.. I think some the text of the mantra "sahana vavatu..." that are shown in the video should be corrected. Thank you Vishwa for this information.. I have redone and updated the video. Namah Shivaya.